Partial view of Camp Edwards, Falmouth, Massachusetts, where the 7th Station Hospital was activated 10 February 1941. The 7th Station Hospital was officially activated 10 February 1941, at Camp Edwards, Falmouth, Massachusetts, as per General Order # 5, HFCA, dated 4 February 1941, pursuant to authority contained in Paragraph 9a and 9a (1), War Department Letter AG 320.2 (dated 7 January 1941) M (Ret) M-C, dated 13 January 1941. First Lieutenant Bernard C. Berman, MC (Reserve) and Captain Charles W. Buckingham, MAC (Reserve) were assigned to the 7th Station Hospital 14 February 1941 after first completing the Second Refresher Course at Carlisle Barracks, Carlisle, Pennsylvania (Medical Field Service Training School –ed). They already reported for duty at Cp. Edwards, Massachusetts (Antiaircraft Artillery Training Center; acreage 21,322; troop capacity 1,945 Officers and 34,108 Enlisted Men –ed) on 13 February 1941. Vintage linen postcard illustrating the cantonments of Fort Devens, Ayer, Massachusetts. Fort Devens was the Post where the first 22 Enlisted Men (Selective Service men) were assigned to the 7th Station Hospital. A cadre of 3 Enlisted Men, consisting of 1 Corporal plus 2 Privates First Class (cooks) were transferred to the organization from the 1114th CASU, Medical Detachment, Station Hospital, Camp Edwards, by Special Order # 22, Headquarters Camp Edwards, Falmouth, Massachusetts, dated 3 February 1941. Special Order # 35, as amended to HFCA Service Unit 1112th, Fort Devens, Ayer, Massachusetts, (Military Reservation; acreage 11,796; troop capacity 2,066 Officers and 33,232 Enlisted Men –ed) dated 10 February 1941, assigned 22 Selective Service men to the 7th Station Hospital (11 of these men were transferred to the 1114th CASU by Special Order # 37, on 24 February 1941). By 19 May 1941, subsequent orders had brought the number of Enlisted Men of the Hospital to its authorized training strength of 75 EM. Special Order # 122, War Department, dated 26 May 1941, assigned Lieutenant Colonel Charles F. Davis, MC, Regular Army to the 7th Station Hospital as Unit Commander. One of the many aspects of field training. How to handle and care for litter patients. This particular phase illustrates splinting. All personnel were given the basic 13-week course following the Medical Department Mobilizattion Training Program (MTP 8-1 –ed). The Training program was effectively started 20 February 1941. Practical Training in the Station Hospital, Cp. Edwards, Falmouth, Massachusetts, was instituted early and continued throughout the year. Duties were shifted from time to time to diversify training. Technicians returning from Service Schools were given time to acquire practical experience in their specialties. Administrative Training was conducted within the 7th Station Hospital organization from the beginning and continued during the year. Class instruction for selected groups was conducted in Medical Department Administration; including Medical Supply, Detachment and Personnel Reports, Mess Management, Medical Department Reports, and general Correspondence, Hospital Records and Organization. Personnel and Administrative duties were rotated to diversify training. Technical Training other than outlined above was also conducted with the 7th Station organization. All members of the Medical Detachment were trained to drive ambulances and cargo trucks with the exception of 2 men who seemed impossible to train. Class and field instruction in Sanitation, including the training of Sanitary details was equally conducted. Selected personnel were assigned to duty from time to time under the Post Sanitary Officer. Class and field instruction in the use and care of organizational training and equipment and miscellaneous hospital equipment was carried on. Another illustration of field training. Basic treatment and care of litter patients. While most of the training took place at Camp Edwards, some Enlisted Men were sent away to a number of Service Schools including Fitzsimons General Hospital (Denver, Colorado) – Walter Reed General Hospital (Washington D.C.) – Bakers & Cooks School, Cp. 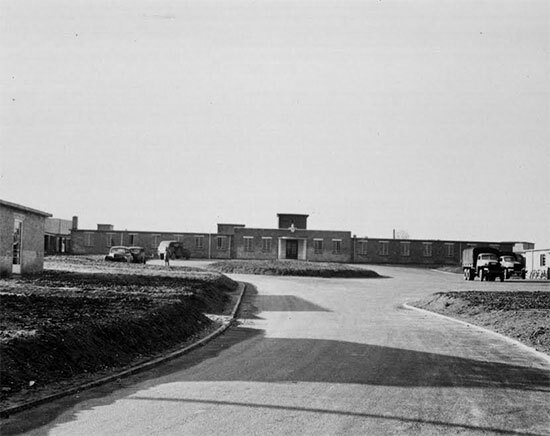 Edwards (Falmouth, Massachusetts) – Motor Maintenance School, Ft. Devens (Ayer, Massachusetts). The Training of Officer personnel was conducted in conjunction with Detachment Training by Officer class and group instruction under the personal supervision of the unit Commanding Officer. Each Officer was assigned administrative positions during this training period and sufficient rotation of duties was accomplished. Practical experience was gained by duty in the Post Station Hospital, Cp. Edwards by administrative duty with the organization and by the conduct of Detachment instruction. Three (3) of the 5 Medical Officers completed the Course of Tropical Medicine at the Army Medical School, while 1 Medical Officer and 1 Medical Administrative Corps Officer completed the Refresher Course at Carlisle Barracks as mentioned above. On 22 July 1941, the 7th Station Hospital was attached to the 1st Infantry Division as part of the “Carib Force” for Army Maneuvers which lasted until 14 August 1941. At the end of these Maneuvers, the unit returned first to Ft. Devens, Ayer, Massachusetts, and later to Cp. Edwards, Falmouth, Massachusetts, where training was re-instituted. A considerable part of the general training was conducted during the period following the “Carib Force” Maneuver. On 1 January 1942, the 7th was still stationed at Cp. Edwards under the command of Lieutenant Colonel Charles F. Davis. The organization’s strength was 7 Officers and 53 Enlisted Men. The training program continued throughout the year, until the 7th Station Hospital set up as a functioning unit on 1 December 1942. While at Cp. Edwards, the staff and personnel conducted their training at the Post’s Station Hospital. In addition to this, classes were held for the NCOs covering all phases of Hospital Administration such as; Sick and Wounded Reports, Personnel, Medical Supply, Mess Management, and other allied reports. The entire unit was furthermore given a program of training in Close Order Drill, the Pitching of Ward Tents, Field Marches, etc. In this way, the 7th trained in the basic requirements of medical soldiering. General view of Musgrove Park medical installations, Taunton, Somerset. This became the organization’s one and only station in the United Kingdom (October-November 1942). On 1 March 1942, the unit was attached to VI Army Corps. 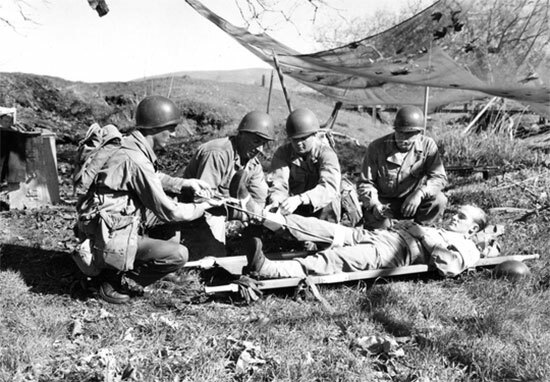 At this time several newly-activated hospital units, among them the 3d Convalescent Hospital – 11th General Hospital – 14th Station Hospital – 15th Station Hospital – 16th Station Hospital – and 57th General Hospital were ordered to Camp Edwards, Massachusetts. They were then placed in charge of the 7th Station Hospital for training purposes. 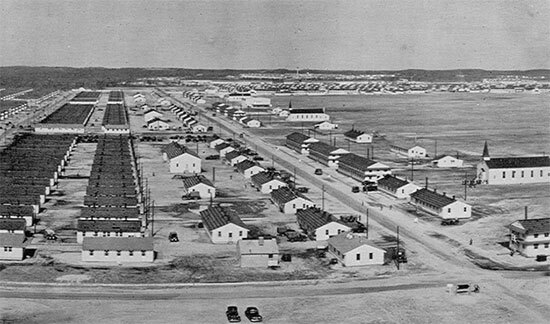 The grouped units were designated the VI Army Corps Hospital and Medical Training Center. In this way, the 7th was able to make use of its previous training in helping to fit the above-named units for duty. This particular phase continued until 21 July 1942, at which time the 7th Station Hospital was ordered to move to Camp Kilmer, Stelton, New Jersey, the Overseas Staging Area for New York Port of Embarkation. For the greater part of 1942, the 7th had in its possession only organizational and individual equipment. No medical supplies, other than those necessary for operating a Dispensary and for training purposes were on hand. The number of vehicles at Cp. Edwards was satisfactory, as they included 8 ambulances – 2 staff cars – 1 carryall – 2 ¼-ton trucks – 4 1½-ton trucks – and 2 2½-ton trucks. These vehicles were all turned in to the QMC Officer, NYPOE, prior to movement overseas. The organization staged at Cp. Kilmer until 24 September 1942 supervising the area Infirmary and continuing its current training program. On this date Colonel Charles F. Davis was relieved by Colonel James M. Tribble, MC, and transferred to the 21st General Hospital, and on that same day, the unit left Cp. Kilmer for the New York Port of Embarkation. Following an uneventful voyage, during which the unit operated the ship’s Infirmary and Hospital, the 7th landed in the United Kingdom on 8 October 1942. It was subsequently stationed at Musgrove Park Military Hospital, Taunton, Somerset (eventually taken over by the 67th General Hospital which occupied the site and began operations as from 5 December 1942 onward –ed). Once more, it did not operate as a real hospital, but was staged for duty in North Africa. The stay in England was marked by continued training while much hard work was spent in the procurement of the equipment and supplies which the 7th was to have need of very soon. During its stay in the UK, the unit was attached to II Army Corps. Main entrance to the 7th Station Hospital, Musgrove Park, Taunton, Somerset. During the organization’s stay in Taunton, England, Colonel James M. Tribble became ill and was transferred to the Detachment of Patients, 152d Station Hospital when the 7th embarked on 8 November 1942 with destination North Africa. Major Charles H. Frantz, MC, then assumed command until relieved by Colonel Merritt G. Ringer, MC, 24 November 1942. Marked personnel increases occurred in March 1942, when the EM strength was increased to 144 by transfers from Camp Lee, Petersburg, Virginia (Army Service Forces Replacement Training Center –ed) and Fort Riley, Junction City, Kansas (Cavalry Replacement Training Center and School –ed). During the same month, the number of Officers also mounted to 44. In April, 10 more Officers brought the total to 54. During this period several promotions were also announced, among which the promotion of Lieutenant Colonel Charles F. Davis to bird Colonel. During June-July 1942, the organization suffered many changes in strength. Five (5) Officers were transferred to other units, and finally 90 ANC Officers joined at Cp. Edwards, Massachusetts, on or about 1 July. More EM followed, bringing the Enlisted strength to almost 300. Final transfers from Camp Grant, Rockford, Illinois (Medical Replacement Unit Training Center –ed), joined the 7th while staging at Cp. Kilmer, New Jersey. The next significant personnel change in England occurred when 2 Chaplains joined the unit. They were First Lieutenant Perry T. Raley and First Lieutenant John G. Wise. The unit finally embarked for a voyage to North Africa in the Mediterranean Theater of Operations from a port in Scotland, United Kingdom, and after another uneventful journey landed at Oran, Algeria on 21 November. Official arrival in the MTO was 22 November 1942. After debarking the 7th Station Hospital bivouacked a few miles outside the city of Oran until 1 December 1942, when it replaced the 77th Evacuation Hospital which had been operating the “Hôpital Civil” in Oran, Algeria. In addition, the 7th also took over the “Clinique Générale”, 34, Rue de la Vieille Mosquée, Oran, which it then operated as an Officers and Nurses ward. This was the FIRST time the 7th actually operated as a hospital! However, in this first month, it was clearly demonstrated that the long period of training and preparation in the ZI helped the organization overcome the many obstacles encountered in establishing a Station Hospital in a foreign country. When relieving the 77th Evac it was necessary to exchange equipment and supplies of the two units while the treatment of patients was carried on. This was accomplished in good order, and after a few days the 7th began operation with its own supplies. It should be added that as of 24 November orders had been received to start infiltrating the buildings occupied by the 77th Evacuation Hospital in the French “Hôpital Civil” and another building called the “Clinique Générale” situated downtown. This infiltration was to be completed to enable the 7th to take charge by 1 December 1942. At the same time the news reached the staff that the equipment was beginning to be unloaded on the docks but that all the transportation and tentage had been lost. 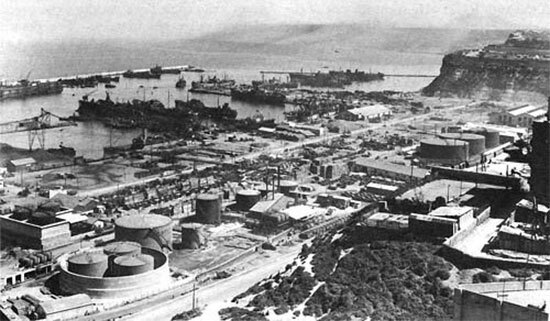 Partial view of Oran harbor, Algeria, North Africa in April 1943. All the equipment authorized for a 750-bed Communications Zone Station Hospital was drawn and arrived intact at Oran, except for some T/BA equipment including all transportation! The unit had to do with a single ¼-ton truck – 1 ¾-ton weapons carrier – and 2 2½-ton cargo trucks. Two (2) ambulances were on loan from another hospital unit and some more trucks were eventually borrowed from the US Quartermaster and the French Army to move the hospital supplies from the docks to the building. It was unfortunately discovered that many of the boxed supplies were not in agreement with the shipping tickets and also that many contained various classes of unnecessary supplies. Upon arrival in Oran, Algeria, the 7th encountered some difficulty in securing quarters for the personnel. At the close of 1942, 2 Officers were quartered in an apartment house near the Hospital; the EM set up in a bakery; the Nurses went to a hotel and the attached US civilian personnel went to a normal school. All these buildings were requisitioned through the US Corps of Engineers. Other Officers moved into ward tents (later replaced by Nissen huts), while the Nurses who moved into the previously mentioned hotel in town shared their billets with ANC Officers of two other hospitals. The EM only gradually moved from the staging area into the two upper floors of a nearby building, which was being renovated as a bakery for the French Armed Forces, but was not quite completed. Its first floor was meanwhile used as a Medical Supply area. 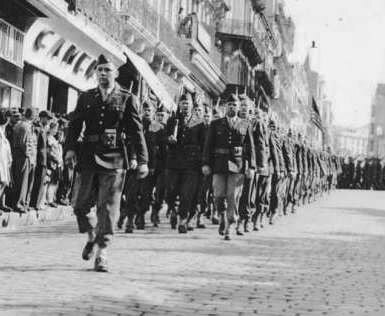 American troops parade through Oran, Algeria. By 1 December 1942, the 7th Station had completely taken over the five pavilions in the “Hôpital Civil” (pavilions 14 + 16 for surgical cases with 2 operating rooms (also including EENT and dental clinic); pavilions 6 + 8 for medical services (including general, psychopatic, and neurological cases), and pavilion 10 for the medical service (including contagious cases and an isolation ward), the unit’s headquarters, and mess facilities; all buildings had suitable latrine facilities, bathing and washing, and diet kitchens on each floor –ed) assigned for American use. The 77th Evacuation Hospital turned over its 494 patients of all types, which included many soldiers wounded in the first action of “Operation Torch”. The “Hôpital Civil” complex was composed of 30 separate buildings, with the major portion occupied by both French military and civilian medical personnel. 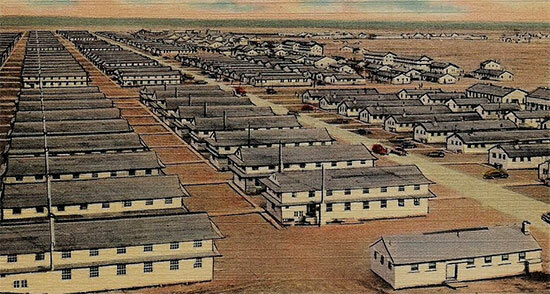 Later expansion units were set up in the form of Nissen huts and ward tents, containing beds, latrines, offices, and kitchens, to accommodate 400 patients and 500 Enlisted Men (own group of personnel and smaller attached units). The works were completed in March 1943. Surgery at first lacked the necessary hot steam for sterilizing equipment. A stationary steam boiler, which actually was used as a delousing unit was acquired and rigged and the steam piped to the sterilizing unit. The X-Ray Service personnel discovered, after unpacking its equipment, that many vital parts were either missing or severely damaged and beyond repair. Two (2) field units were finally assembled with much ingenuity. Meanwhile the 7th obtained additional help from the French Hospital X-Ray Department which loaned some of its own equipment. Mess and kitchen facilities proved inadequate (there were some 1200 people to be fed in all) so a large canvas cover was constructed over the porch in pavilion 10, with a battery of field ranges. Water for general use was found unsuitable for drinking and potable water was therefore supplied by the Engineers. Additional water points were created to support the large number of people operating in the hospital area. Since much of the Laboratory Service supplies was either missing or broken, the French Civilian Hospital gave the necessary help while equipment was being requisitioned. Series of pictures illustrating the cluster of US Hospitals established at Leghorn, PBS, Italy. Illustrated are the 7th Station – 12th General – and 33d General Hospitals. The 12th General Hospital was the largest unit in the group and was set up in the northern outskirts of Leghorn, while the 7th Station Hospital moved into a former Fascist Youth Camp at Tirrenia, on the seacoast approximately 4 miles north of the city. The 33d General Hospital moved in at Tirrenia some 5 days later, following the 7th Station. For the many months after it began to function, the 7th Station Hospital was a combination of various types of services, plus being a General and Dental Laboratory. The large number of troops in the vicinity used the organization as a true Station Hospital. It was also employed as an Evacuation Hospital for casualties coming in from Tunisia by air. In addition, it was used in the chain of evacuation for wounded, moved by train and/or ship. Moreover, the 7th had boarding power for the Zone of Interior for sick and wounded patients. As a rule it should be stated that the 7th Station Hospital received the most serious cases because it was close to port and railroad infrastructures. Patients were not held until complete recovery but after definitive treatment was accomplished, they were transferred to a General Hospital as soon as they were transportable. As there were no other laboratory facilities in the vicinity, the 7th did all kind of lab work for other hospitals, even providing services to the Provost Marshal and the Quartermaster Graves Registration Service. It was months before a morgue was established, therefore the 7th performed 128 autopsies in 1942. 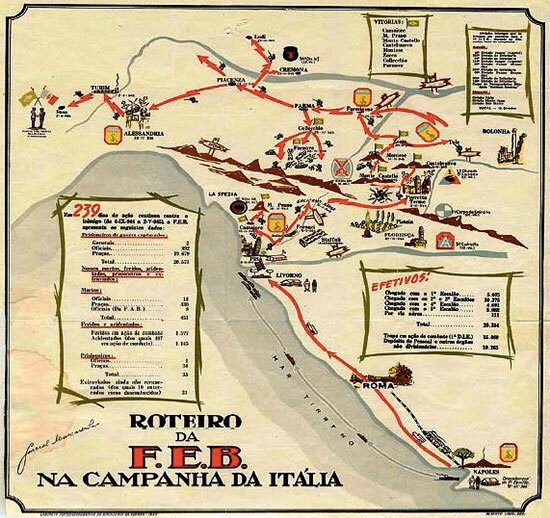 Road Book Map illustrating the Italian Campaign of the Brazilian Expeditionary Force (B.E.F.). 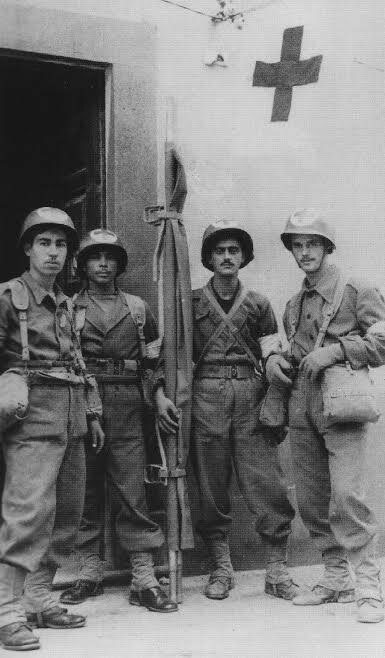 The Força Expedicionària Brasileira consisted of about 25,700 men and women who fought alongside the Allies in Italy from September 1944 to May 1945. The B.E.F was commanded by General Mascarenhas de Moraes. One of the great difficulties encountered by the 7th Station was the hospitalization and disposition of Prisoner of War patients. As this organization was the only hospital operating in the area for some time it was therefore the first to encounter the problem of prisoner patients. It would become the unit with the only Prison Ward in this part of the Base Section. Since beginning operation, the Hospital admitted almost 1,000 prisoners. As there was no prison ward in the early days, the organization had to provide guards, but this proved unsatisfactory consequently 2 rooms in pavilion 10 were barred and guards provided by the Provost Marshal. Capacity provided was only 14 prisoner beds. 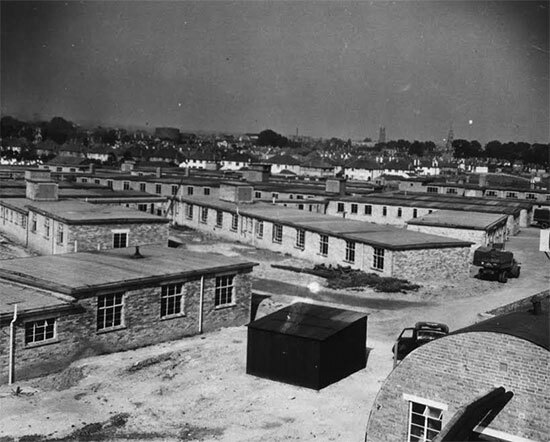 The inadequate capacity was later solved by placing bars on a 50-bed Nissen hut. During the first year of operation (December 1942 – December 1943) it is believed that the organization had one of the highest admission rates among all US hospitals in Africa, as it admitted almost 24,500 patients, whose average stay amounted to 9 days. In addition the unit treated a tremendous number of outpatients reaching over 150,000. During peak patient loads, the Hospital employed 65 to 70 French civilians, who were trained for KP, ward kitchen details, various janitor and ash-and-trash details, which helped relieve the personnel of the command. The French civilians were eventually discharged and replaced by Italian PWs. During its stay in North Africa, there was a rather large turnover of personnel in the organization, especially among the Officers and Nurses. Lieutenant Colonel Charles H. Frantz, MC, Chief Surgical Service, developed TBC and was returned to the ZI. Major Rolland R. Best, MC, was assigned from the 3d Auxiliary Surgical Group early in 1943 and became the new Chief of Surgical Service. Lieutenant Colonel Arthur M. Kraut, MC, Chief of Medical Service was transferred in the latter part of 1943 and Major Daniel W. Myers, MC ordered in from the 21st General Hospital as his replacement. First Lieutenant Ruth Payne, ANC, Chief Nurse, was ordered to the Eastern Base Section and her assistant, First Lieutenant Grace Montagriff, became Chief Nurse of the 7th Station Hospital. Notwithstanding the work load and the high patient census, there was an attempt within the command to carry out a training program. With approval of the Mediterranean Base Section, the EM were divided into 2 groups. Each trained two mondays a month. The CO further found it necessary to push this training program at many Officers’ calls, as the ward Officers always had excuses that their services were too busy to spare men for training. Full attendance was finally accomplished by permitting no one to be excused except on written permission of the Commanding Officer or Executive Officer! To compensate for the daily work, a large recreation tent was erected where movies were shown four nights a week for those off duty. Orientation lectures were organized by the Chaplain each week, and volleyball and baseball occupied the men during summer. Recreation indeed caused a considerable problem when passes were limited to 10%, which meant that 90% of the personnel had to remain inside the wire enclosure. The restriction on passes was therefore removed on 15 July 1943. Following the decision to concentrate Communications Zone functions in Italy in November 1944, existing Base Sections were brought back under the control of Theater Headquarters at a time when the progress of the war was concentrated in the Mediterranean, and mainly in Northern Italy. As the Invasion of France “Operation Dragoon” had left the Theater short of troops, transportation, equipment, and hospital beds, the North African Theater (NATOUSA) had been stripped of supplies and hospital beds to build up new bases in Southern France, the Eastern and Atlantic Base Sections were absorbed by the Mediterranean Base Section on 15 November 1944 (now designated MTOUSA). 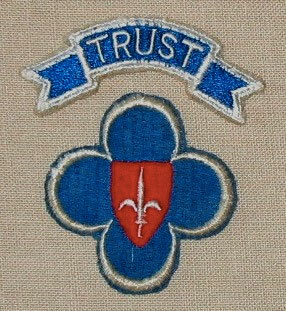 Special shoulder sleeve insignia illustrating “TRUST” (Trieste-United States Troops). The insignia was based on the one used by the US 88th Infantry Division, which remained as the main Occupation Force and supplied personnel to TRUST, when taking over occupation of the Free Territory of Trieste from British Forces in May 1947. The Peninsular Base Section (PBS) now grew in importance and as soon as the port of Naples and the hospitals concentrated in that area were no longer needed for logistic support of the US Forces operating in Southern France, the Base Section began shifting its strength to the Leghorn-Florence-Pisa triangle, with PBS Headquarters now established in Leghorn as of 25 November 1944. The 750-bed 7th Station Hospital, which had been staging at Oran, Algeria since 31 July 1944, finally arrived in the Leghorn area, setting up at Tirrenia, a former Fascist Youth Camp on the sea coast about 4 miles north of the city. The unit opened on 29 September with the facilities and bed strength of a US General Hospital. Shortly following its establishment, it was designated to hospitalize all Brazilian ground personnel in the area, and by December was caring for over 700 Brazilian patients in addition to a full load of American patients. To supplement the personnel of the command and in view of the high patient census, 15 Medical Officers, 2 Dental Officers, 3 Pharmacists, 1 Chaplain, 23 Nurses, and 32 Technicians, all Brazilian, were attached. Brazilian medical strength at the 7th Station Hospital eventually reached 27 Officers and 65 Enlisted Men, while Nurses’ strength declined to 18. At the time the Brazilian Medical Liaison Officer responsible for the well-being of the Brazilian patients was Head Nurse Elza Cansançao. In the course of time as language barriers and differences in medical practice were overcome, the Brazilians were fully integrated into the command. Between 7 October and 12 December 1944, 5 Brazilian Medical Officers and 6 Nurses also served with the 154th Station Hospital to care for personnel of nearby-stationed Brazilian Air Force units. Based upon the decision to inactivate Category IV units in the Theater, PBS (Peninsular Base Section –ed) hospitals started closing out rapidly. The 7th Station Hospital was eventually inactivated 15 September 1945. In April 1947, the PBS was disbanded and its installations and responsibilities transferred to the Port of Leghorn organization. It was however re-activated 1 May 1947 as a 200-bed Station Hospital for service to “TRUST” (Trieste, Italy) as of 19 September 1947. The reason was the border dispute between Italy and Yugoslavia, each claiming the important city of Trieste. 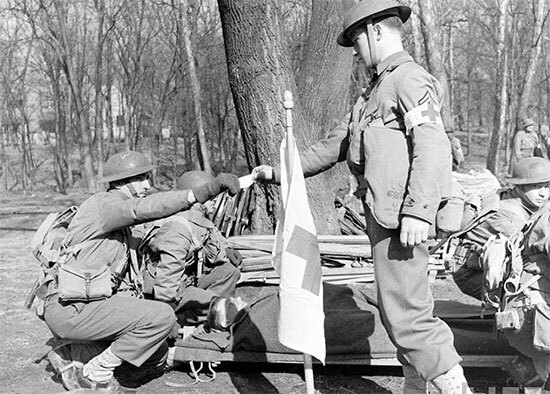 The 88th US Infantry Division remained as the occupation force and supplied personnel for the Trieste-United States Troops, which took over occupation of the Free Territory of Trieste from British Forces in May of 1947 (the 7th Station Hospital was re-activated with personnel drawn from the 391st Station Hospital supplemented by troops of the 88th Infantry Division, and eventually turned over to “TRUST” on 19 September 1947 –ed). 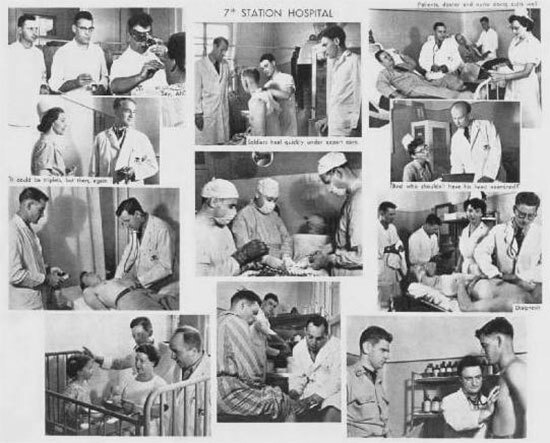 Collage illustrating the various aspects of medical and other activities conducted by the 7th Station Hospital, while serving with “TRUST” in Italy. Among the vintage reports and documents which served for editing the above Unit History, the authors are still looking for additional reports and data covering the period from end 1944 to September 1945. Any extra data relating to the postwar activities of the 7th Station Hospital and a personnel roster of the organization are equally most welcome. All inputs appreciated. Thank you.